Wergi World Champion for the second time! 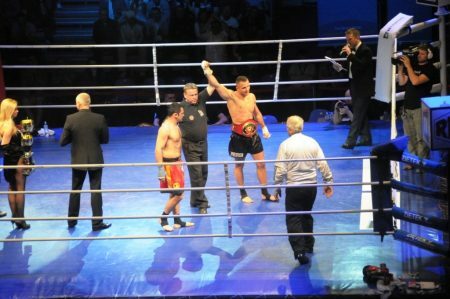 For the second time in his career, Paweł won the title of WKN’s World Championship Champion. Wergi went down the scale (79.4kg limit) and as you can see it was a very good decision. Jędrzejczyk resolved the technical knockout fight in the 4th round, smashing physically strong Georgian Ednari Mukutadze with a series of blows and kicks with his knees. Paweł showed great experience, paid off trips to Thailand and also fights fought there. Georgian beat very strong blows, but most of Jędrzejczyk blocked and kicked off effectively defeating the rival. “I knew that this is a very important fight for me and that I can not afford to fail in the fight for the title. During the preparation I was hurt by injuries but luckily it did not affect the course of the fight. The fight was very strong boxing blows, moment of inattention and everything it could have ended otherwise. Now I am waiting for a longed-for holiday and a period of full training, the first for several years. I am planning to fight next fight from September. A stronger one 🙂 … “- says Paweł.